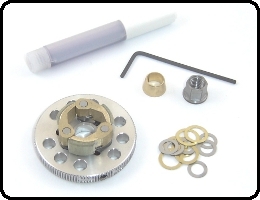 The Buku 1/10th Scale Clutch kit was designed to be a direct bolt on fit for Traxxas nitro models. Buku 1/10th Clutch Kits are pre-assembled and ready to bolt on. The standard flywheel is the same diameter as the stock Traxxas flywheel and is a direct fit. A 40MM flywheel is available for those vehicles using a bump start. 1/10th Brass Bonded Komposite (BBK) Recommended for Revo, Slayer, T-Maxx and all Traxxas Nitro models with upgraded motors. Mandatory for Revo, Slayer and T-Maxx with mid-block (Picco .26) upgraded motors. (Buku 1/8th clutches will not fit on the Picco .26 or any other motor with the TRX style crankshaft. BBK Clutch Kits and BBK replacement shoes include a higher tension spring that is matched to the greater mass of the BBK shoe. ALL KOMPOSITE SHOES REQUIRE USING A NEW CLUTCH BELL. Residue from old clutch shoes will contaminate the surface of the Komposite material causing slippage, excessive heat and will ruin the shoes, sometimes in just a couple minutes! 1/10th Aluminum shoes are generally not recommend for any application other than strict drag racing. (132' straight runs). The short run times in drag racing cause very little wear and as a result aluminum shoes will perform well. If you are street drag racing (informal competition) but also run your vehicle more than the straight drag course then a Komposite shoes is recommended. 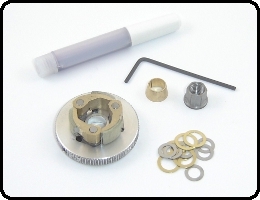 All 1/10th Scale Replacement Components are cross compatible with Buku 1/10th scale flywheels. What kind of Crankshaft do I have? Stock Diameter Flywheel With Aluminum Shoes. 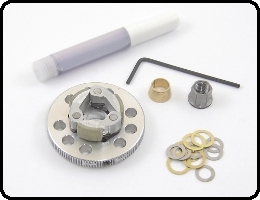 Complete kit with pre-assembled clutch, collet, SG style nut*, hex wrench, shims and special Buku threadlocker. Direct fit for stock Traxxas Nitro Models. Not recommend for any application other than strict drag racing. (132' straight runs). The short run times in drag racing cause very little wear and as a result aluminum shoes will perform well. If you are street drag racing (informal competition) but also run your vehicle more than the straight drag course then a Komposite shoes is recommended. 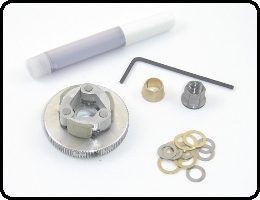 *Use your stock Traxxas nut for installation of the Buku clutch. All Traxxas models also include a 1/4-28 SG style nut. This will not fit a Traxxas crankshaft. Save this SG nut in case you purchase a replacement motor or move the clutch to a motor with a standard SG crank. Stock Diameter Flywheel With BBK Shoes and high tension springs. Complete kit with pre-assembled clutch, collet, SG style nut*, hex wrench, shims and special Buku threadlocker. Direct fit for stock Traxxas Nitro Models. Recommended for Revo, Slayer, T-Maxx and all Traxxas Nitro models with upgraded motors. Mandatory for Revo, Slayer and T-Maxx with mid-block (Picco .26) upgraded motors (not for bump start applications). Komposite shoes require use of a NEW, Traxxas stock size clutch bell. Stock Diameter Flywheel With ABK Shoes. Complete kit with pre-assembled clutch, collet, SG style nut*, hex wrench, shims and special Buku threadlocker. Direct fit for stock Traxxas Nitro Models. Recommended for Jato, 4-Tec, Nitro Rustler, Nitro Sport. Can also be run on Revo, Slayer and T-Maxx models if a more moderate torque rise is desired for greater control (not for bump start applications). 40MM Flywheel With Aluminum Shoes. For use with bump start applications. Complete kit with pre-assembled clutch, collet, SG style nut*, hex wrench, shims and special Buku threadlocker. Direct fit for stock Traxxas Nitro Models. Not recommend for any application other than strict drag racing. (132' straight runs). The short run times in drag racing cause very little wear and as a result aluminum shoes will perform well. If you are street drag racing (informal competition) but also run your vehicle more than the straight drag course then a Komposite shoes is recommended. 40MM Flywheel With BBK Shoes and high tension springs. For use with bump start applications. Complete kit with pre-assembled clutch, collet, SG style nut*, hex wrench, shims and special Buku threadlocker. Direct fit for stock Traxxas Nitro Models. Recommended for Revo, Slayer, T-Maxx and all Traxxas Nitro models with upgraded motors. Mandatory for Revo, Slayer and T-Maxx with mid-block (Picco .26) upgraded motors. 40MM Flywheel With ABK Shoes. For use with bump start applications. Complete kit with pre-assembled clutch, collet, SG style nut*, hex wrench, shims and special Buku threadlocker. Direct fit for stock Traxxas Nitro Models. Recommended for Jato, 4-Tec, Nitro Rustler, Nitro Sport. Can also be run on Revo, Slayer and T-Maxx models if a more moderate torque rise is desired for greater control. 1/10th Brass Bonded Komposite Shoes and high tension springs. Fits all Buku 1/10th Traxxas flywheels. 1/10th Aluminum Bonded Komposite Shoes and springs. Fits all Buku 1/10th Traxxas flywheels. 1/10th Aluminum Shoes and springs. Fits all Buku 1/10th Traxxas flywheels. 1/10th Collet. Fits all Buku 1/10th Traxxas flywheels.